For the first time since going full-time in the Monster Energy NASCAR Cup Series, seven-time champion Jimmie Johnson will have a new crew chief in 2019. 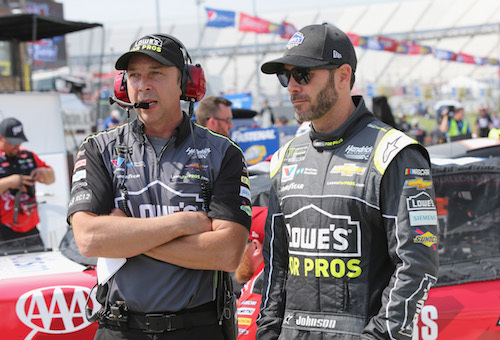 Chad Knaus, who has been the crew chief on Johnson’s No. 48 teamsince 2002, will be William Byron on the No. 24 HMS team next season, replacing Darian Grubb. Grubb has been promoted to the position of Technical Director. Kevin Meendering will be Johnson’s crew chief next year, moving from the No. 1 JR Motorsports team of Elliott Sadler in the NASCAR Xfinity Series. Sadler is retiring from full-time NASCAR competition at the end of the 2018 season. JR Motorsports is co-owned by Hendrick Motorsports owner Rick Hendrick. Knaus, Grubb and Meendering will complete 2018 in their current roles. Knaus and Johnson are under contract with Hendrick Motorsports through the 2020 season. Their 17-season partnership is the longest in NASCAR. Their seven championships is a record-matching number for driver Johnson and one shy of tying the crew chief record of eight held by Dale Inman. Also, Johnson’s 83-career wins tally places him in a tie with Cale Yarborough for sixth on the all-time wins list. The 2018 has been a struggle for Johnson and Knaus. They are winless, 30 races into the 36-race season. Their last win came last June at Dover (Del.) International Speedway. Johnson was eliminated from the 2018 playoffs in the first round.